"Fancy coming to Ascot?" was the question I was asked a few months ago. Hell yeah! A new posh frock, the oh-so-rare chance to get glammed up, perhaps a little flutter on the gee-gees? Fast forward to the here and now, Saturday morning to be precise, stupid o' clock to those who don't have small children (so a walk in the park for us...) we climbed on the coach and let the madness commence. I say madness, I mean the 25 things that ALWAYS have to happen at a day at the races. You get dressed, put a fascinator the size of a small satellite dish on your head, then proceed to bash your head not one but several times before you even leave the house. You also try it on the right and the left side of your head as it doesn't have a label in it and you really haven't a clue which way it's suppose to go on. You ask your husband how you look. And receive the standard answer "Fine". Without him actually looking. This is not fine. You arrange to meet before 8am. But get there 20 minutes late due to the satellite dish on your head and having to force your husband to put towels down in the back of the car so you and your friend don't have to sit in dusty doggie footprints in your posh new frocks. You pile on the coach and the men in the party spend a good twenty minutes attempting to work the iPad so sport can be watched. Most important. Of course the wifi only occasionally works. This causes much frustration. Drinks are offered. It's 9am but exactly the same as when you go on holiday, arrive at the bar in the airport, think "ahh, why not (or words to a similar effect" and start on the fizz. You have never been so blinking careful in your whole damn life not to spill a drop of the fizz. Because of the frock. This could ruin the day right? General consensus around the females of the group - your satellite dish headpiece is on back to front. It is promptly turned around, selfies are taken, head is bobbed around a little, you decide you like it better the other way, swap it back and hope for the best. You arrive and everyone has to make a mad dash for the portaloos due to the fizz consumed thus far. Your feet begin to hurt. Heels and grass do not go together. Champagne on arrival and free wine on the table. Lots of it. This could possibly get messy. 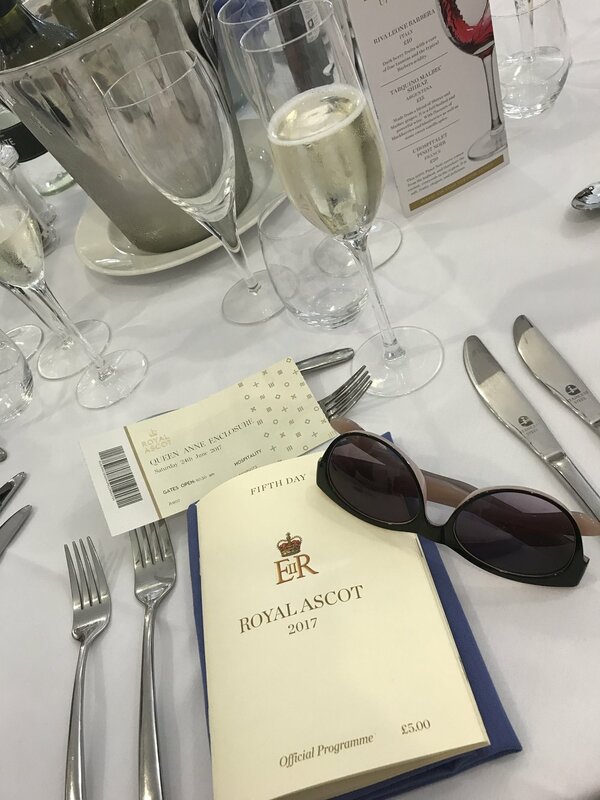 You take several arty Instagram shots of the table, the menu, the race card and of course your sunglasses that look cool in the picture and makes it look as though it was just a quick snap and not as try hard as it so obviously was. You go down to the parade ring in the vain hope of spotting a Royal. You decide any Royal will do as long as you can get a good photo. One Land Of Hope And Glory and a National Anthem later, a carriage comes past. It's only the blooming' Queen! She looks amazing, you feel very proud to be British and know your Nana would have loved this. Husband shows you a "selfie" he did when the Queen came past. You are a bit gutted you didn't think of that idea. Seriously. The first race. You fight your way through the crowds and stand at the Grandstand, attempting to find a spot where you can preferably see the racecourse, aren't squished next to a sweaty man in a suit who has been well acquainted with the beer tent and where you have at least a vague chance of seeing a horse. Winner!!!! The horse you picked actually wins! Your way of picking horses obviously works! This is flawless, this is perfect, oh wait. You put it on a place pot not to win. Prize winnings? Nowt. Husband on the other hand has had the first three horses and waves his winning slip in your face. Rude. You fight your way back to the table and try a different method of choosing a horse and decide to watch the race from there. You lose again. You do some people watching outside and feel you could make this into a decent pastime. Marks are given on outfit choice and how drunk they are. You receive a message from a friend you didn't know was there. You get quite excited, message each other all afternoon with the same texts "where are you", "By the Grandstand" and still don't manage to meet up. Sorry Nick. Band stand time. Singalong time. For the first few, it's a bit awkward. Then they play Sweet Caroline and the party starts. People are verrrrrrr drunk by now. We all have another glass to celebrate the fact we're still standing. Time to find the coach. One of our party didn't get the memo that we'd all walk back together so wanders off to find it himself. In the rain. Comes back to find us half an hour later soaking and steaming slightly. (Rain mainly, not alcohol.) Hilarity ensues. We all make it back to the coach without getting too wet from the rain, without losing anyone, without sinking into the grass in those perilous heels, without being too inebriated and yes, without any money. The next day you casually, yet with a slight sense of dread google "worst dressed at Ascot" to ensure you haven't been papped. Phew. Got away with it. Same again next year then? ?